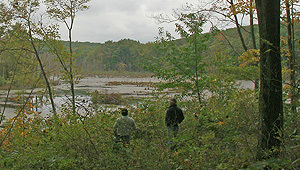 For more than 20 years, local conservationists have sought to protect the Baker Firestone property in the New Jersey Highlands. The 835-acre property connects more than 3,000 acres of protected land and includes habitat for many wildlife species-including bobcat, golden-winged warbler, Indiana bat, and barred owl. Conservation here also safeguards water quality by protecting sensitive wetland areas. The Trust for Public Land helped acquire the land and is conveying 647 acres to the State of New Jersey as an addition to the Rockaway River Wildlife Management Area. The remaining 188 acres will be managed by Jefferson Township as a recreation and open space area.